It’s officially the holiday season. It can be a stressful – or at least hectic – time of year, so it’s important to start each day with some healthy fuel. 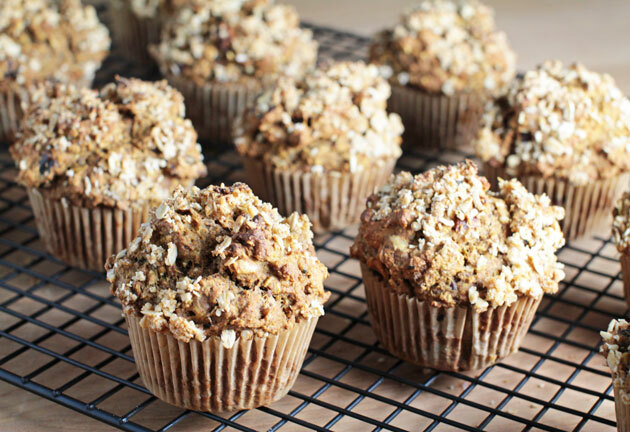 Cue these delicious and seasonally-appropriate breakfast muffins. Make a batch on Sunday and have a quick, easy, grab-and-go breakfast all ready for the week ahead. 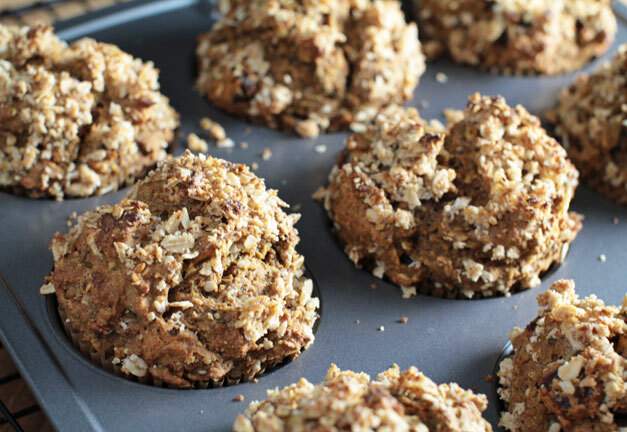 This recipe is packed with health-boosting whole grains (spelt flour and rolled oats), which, in addition to the almond flour, nuts and seeds, give you a well-rounded, plant-based protein boost. They are also low in sugar and oil-free. But perhaps the real beauty of this recipe – or at least part of the fun – is that you can get creative with your stir-ins. In the photos I’ve chosen chopped dates for their natural sweetness, hemp seeds for protein, and pecans and walnuts for their flavor to complement the pumpkin and spices, but you could just as easily stir in some raisins, dried cranberries, chopped apples, or even some chocolate chips. Choose your own muffin adventure! 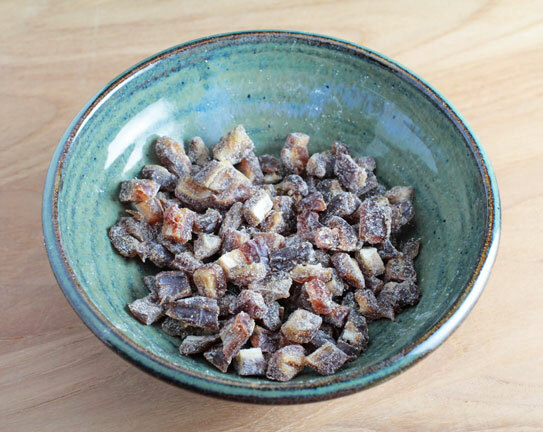 If you’re using dates, remove the pits and chop them into small pieces. In a bowl, sprinkle the pieces with a little bit of flour, and toss them with your fingers, so that they are lightly coated and no longer stick together. 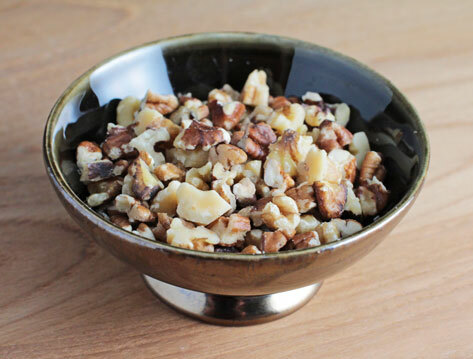 If you’re stirring in nuts, chop them into small pieces and set them aside, as well. Walnuts and pecans are highly recommended. 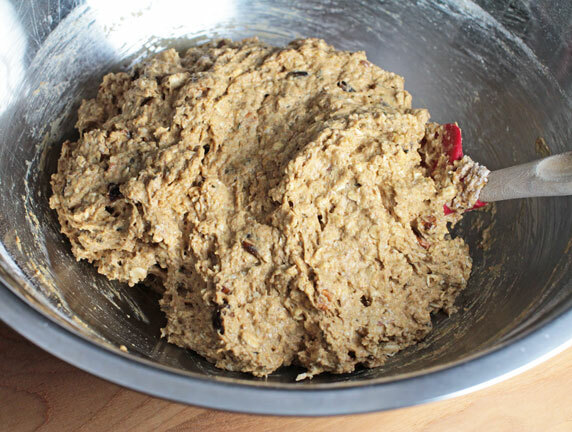 Prepare the topping in a small bowl. 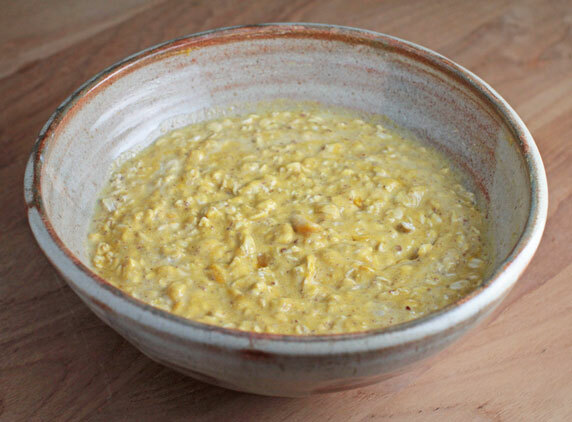 Use a fork to whisk together the ¼ cup of slightly-blended rolled oats, 1 T. of maple sugar or whole cane sugar (I think even maple syrup would work) and the 1 T. of coconut milk (if you’re going oil-free) or coconut oil. Set aside. 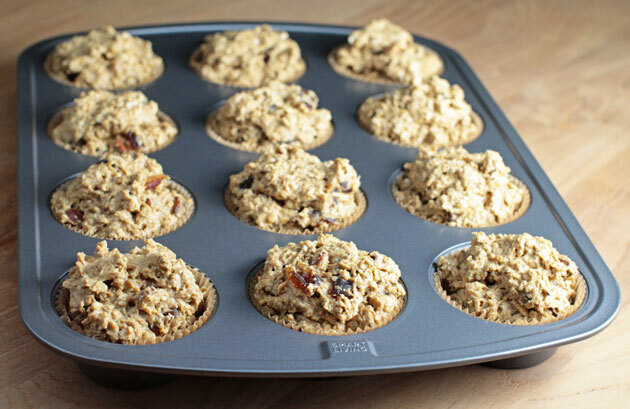 Preheat the oven to 400ºF and drop parchment liners into each well of a regular (12-count) muffin tin. 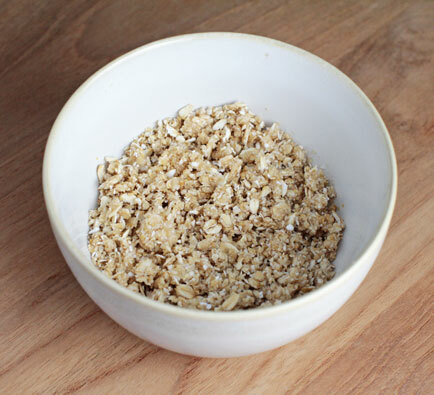 In a medium mixing bowl, combine the rolled oats, almond milk and apple cider vinegar. Set aside. 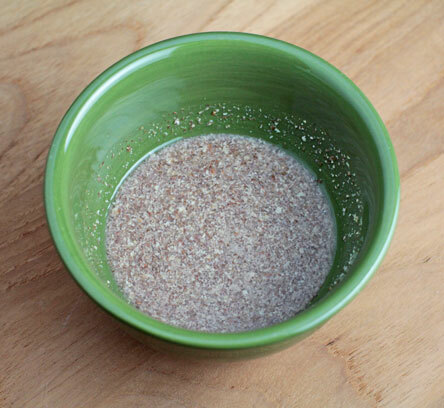 In a very small bowl, combine the flax or chia seed meal and water. Whisk with a fork and set aside. In a large mixing bowl, combine the dry ingredients: spelt flour, almond flour, sea salt, baking powder, baking soda, sucanat and spices. Stir to sift it all together. 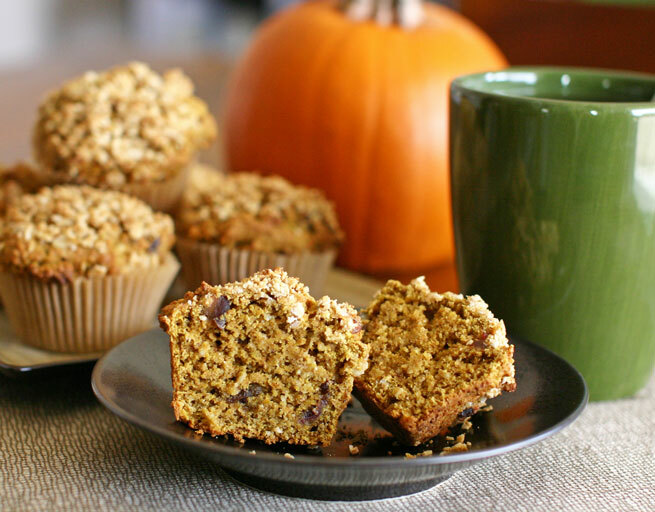 To the oat + almond milk mixture, add the pumpkin puree, flax or chia mixture, vanilla extract and coconut milk. Stir to combine thoroughly. Make a well in the middle of the dry ingredients, and then pour in the wet ingredients. Stir until the batter is just moist, with no more flour streaks visible. Then fold in your stir-ins. Working as quickly as you can to maximize the leavening effect of the baking powder and soda, divide the batter evenly among the 12 wells of your muffin tin. Then, sprinkle a little bit of topping onto each future muffin. Bake for 25 minutes. Remove the pan from the oven, and allow the muffins to cool in the pan for the first 10 minutes. 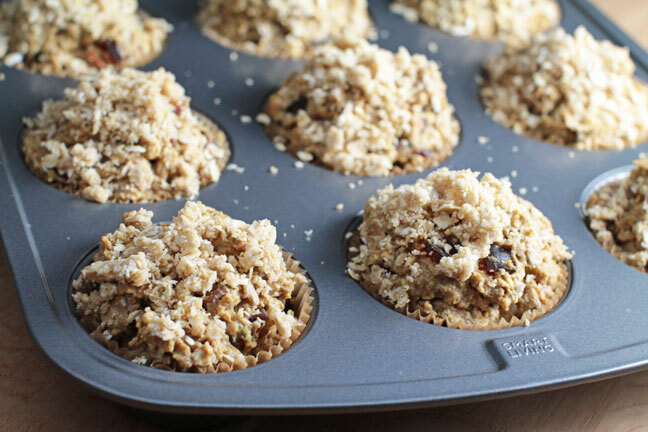 Next, transfer the muffins to a cooling rack to cool the rest of the way. And there you have it… A delicious breakfast made of healthy whole-food ingredients, all ready for the week. Enjoy your muffins and the holiday season!